Trailer - Adventure for the Joyful Spirits! Adam Lynch is a self-published author who has written and published 4 novels, Making Dreams Into Reality, The True Spiritual Nature of Love, The Everlasting Brotherhood, and Adventure For The Joyful Spirits. On March 10th, 2016, he has been a featured guest live on The Millennial Show (channel 15, WDSC). He is currently working on his 5th novel. Adventure for the Joyful Spirits! (The Legend of Three Faithful Heroes) by Adam Lynch is a Christian science fiction fantasy novel that blends aspects of both genres together perfectly. Adventure for the Joyful Spirits! will appeal most to a young adult Christian audience. 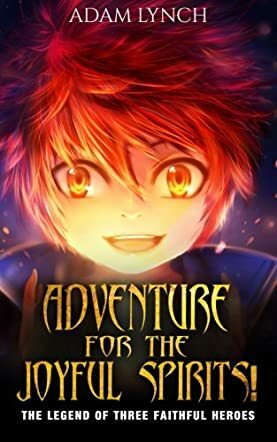 The story follows the three heroes known as Asmund Cranit, Tait Astron, and Eydis Virtue as they quest to defeat Lord Xuohs before he uses his abilities to conquer all of the lands with his evil and deceitful ways. Each of the three heroes has their own power or gift; Asmund Cranit has the sword of the spirit, Tait Astron is able to use the astronomical miracles from above, and Eydis Virtue is known to be able to summon three heavenly beasts. Adventure for the Joyful Spirits! (The Legend of Three Faithful Heroes) by Adam Lynch is a book that immediately reminded me of the Final Fantasy and the Kingdom Hearts video games due to the way the characters behave during the quest. I really liked how Asmund, Tait, and Eydis understood the importance of their quest, but still had time to enjoy it and have fun on the way to saving the lands from Lord Xuohs. My favorite aspect of Adventure for the Joyful Spirits! was actually the settings. I absolutely adored the differences between the lands and the way Adam Lynch described them really allowed me to create the perfect picture in my head.